Named for U.S. labor organizer Eugene V. Debs, Eugene Roy Witten was born in New York City to parents of Jewish ethnicity. His father was a Lithuanian immigrant who had been an active anti-Czarist, and his mother gave up a career as a pianist to raise her family. 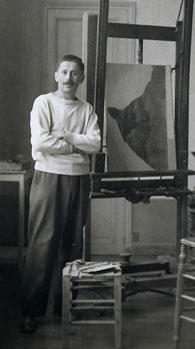 Witten, a Francophile painter and periodic resident of France, died on 13 January, 2004. His life ended peacefully at home while listening to the radio in his favorite wooden rocking chair. Classical music and painting were his lifelong passions. Witten was both dedicated and prolific in his artwork. He painted in oils and his work gradually passed through several stylistic stages during his nearly 60-year career. E.R.Witten’s work reveals rapport with nature and a passion for interaction of soft colors. Since the 1960s most of his paintings were abstract and quite delicate, resembling watercolors. After studies in business at the University of North Carolina at Chapel Hill and a short period in an advertising agency, Gene served as a lieutenant in the U.S. Navy during World War II, with tours of duty ranging from Murmansk to Shanghai. His principal responsibility aboard the U.S.S. Tuscaloosa was testing the ice cream before it was served. On return he was impassioned to leave "business" and entered the Art Students League in Manhattan in 1946. At the age of 25 he decided his life’s work was to paint. Inspired by the work of the Impressionists, in the late 1940s Witten moved to Paris where he partook in the life of cafes and the Montparnasse student boites, and studied at the Academie de la Grande Chaumiere. Awakened to Cezanne, Whistler, Degas and, somewhat later, curious about Seurat, Witten worked in a muted palette overlaying his drawings. An avid walker, he passed quickly beyond the studio work and enjoyed plein-air in the banlieue, easel on his back. During the 1950s, confident and experimenting, Witten returned to Manhattan. He divided his energies between an East Village studio and a budding picture-framing business with another former expatriate, Robert Kulicke. Witten became a skilled gilder and wood carver during the 1950s - rare arts today. This trade continued to be a mainstay of his income well into his seventies. In New York, Witten made a few sorties into group shows. The National Academy of Design purchased a Witten still-life for a touring exhibit. 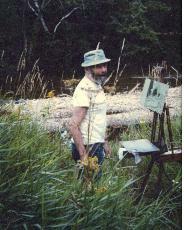 During some sejours in the countryside at Woodstock NY, his focus concentrated on an exploration of the landscape. Common motifs were trees seen through one another, blue rocks, and a transparency resembling watercolor paysages, his subjects departing from figure studies and portraits. After Eugene married artist nee Anita May Reis, the couple sought a refuge for a year (1954-5) near the site of Cezanne's studio in Aix-en-Provence. This exposure to the Provence landscape was formative and stimulating. 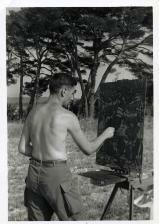 Like Cezanne, Gene would take to the countryside each day with his folding easel on his back. This phase produced a large number of blue canvases and landscapes often framed by large, dark pine trees and dotted with orange roofs. Witten focused on some of the same subjects as Cezanne, most notably Mt. Ste. Victoire, Carriere Bibemus, Barrage Zola and the Route de Napoleon. In 1956 Anita and Gene moved away from New York to find studio space and a respite from the city. In rustic conditions they lived in New Hampshire by Lake Winnipesauke, and then in the beautiful Battenkill Valley of Vermont with their two young sons. In 1962 they settled nearby in the same river valley in adjacent rural New York State (in Shushan, a tiny town approximately halfway between New York City and Montreal). The Battenkill River was (and still is) a premier trout-fishing stream and the surrounding area is principally agricultural. Witten opened a frame shop in a converted garage next to their 1850-era house and later expanded the shop to include a painting studio with a vaulted ceiling, large windows, and a woodstove for warmth. Although most of his paintings done in Shushan were abstract, the local landscape – especially by the riverside – beckoned him back to some stints of landscape painting. Many of these were in winter, with subtle colors of thickets and forest against snow. In 1965 he was thunderstruck and enchanted upon seeing Julius Bissier’s (Swiss) work for the first time in Boston. Precise contrasts in overlapped silhouettes of mysterious urns stirred him to more investigations in washes, which were the bases for many paintings. In the period of the 1960s-70s, Witten’s reputation grew: his works were purchased by private collections (including Francois Mitterand), as well as by Dartmouth College and Boston and N.Y. gallery exhibits. From the 1960s through the 1990s, Witten traveled to France frequently as well as to England, Sweden, and Holland. In Holland his work was shown in two galleries including Albrecht. Throughout his life as an artist, Gene spurned the “New York Art Scene” and utterly dismissed the emphasis many contemporary artists placed on “marketing” their art. Still-lives with pears, daisies, Oriental rugs, etc. In 1976, Witten signed a contract with his admirer, collector, and mentor M. Romanet and joined the Galerie that has championed him for these nearly 30 years. It was Gene Witten’s will that his ashes be spread on Mt. Ste. Victoire. This was done by family and friends in 2005, so he will indeed always belong at least partly in France.